Welcome to my GB Extreme Tour website. I have successfully completed my GB Extreme Tour on time and to schedule and currently (17/7/2013) the sponsorship total stands at £9,507.96 (inc. gift aid) for Brake the road safety charity and the JustGiving page is still open should you wish to donate. The tour was at least 1,500 miles (I got lost a few time and had to double back) cycle ride from John O’Groats to Land’s End on May 20, 2013 calling at 10 extreme geographical points along the way and I cycled on average 50 miles every day over 30 days in aid of Brake, the road safety charity. During the trip I visited locations such as Dunnet Head, the most northerly point in the UK; Whalley, the most central point; Holme Fen, the lowest point; Lowestoft Head, the most Easterly and even took in a trek up Ben Nevis, the highest point in the UK. I have spent 24 years working in Serco’s traffic enforcement market and has decided that I wanted to make my own personal contribution to road safety. Every day five people die and seventy suffer life changing injuries in collisions on Great Britain’s roads and I hope that this challenge will not only raise money but has also raised awareness about the importance of road safety. When you consider the shocking number of people that are killed and injured on our roads, we need to do as much as we can to reduce casualties. I hope that my challenge has helped to raise the profile of road safety and the excellent work carried out by Brake. It was tough, but this important cause, the goodwill messages and the tremendous sponsorship helped to get me through. A big thank you to Gatsometer for very generously providing the bikes for the tour and to Serco for their support for the tour. I must give special mention the publicity and backup team from Road Safety Support Ltd provided me with the best support anyone could ask for and I would like to thank the company and the individuals for their commitment and support throughout the tour. Brake is an independent road safety charity which exists to reduce deaths and injuries on our roads and to provide support for families bereaved and seriously injured in road crashes and it relies on donations from individuals like Graham, companies, and charitable grants. 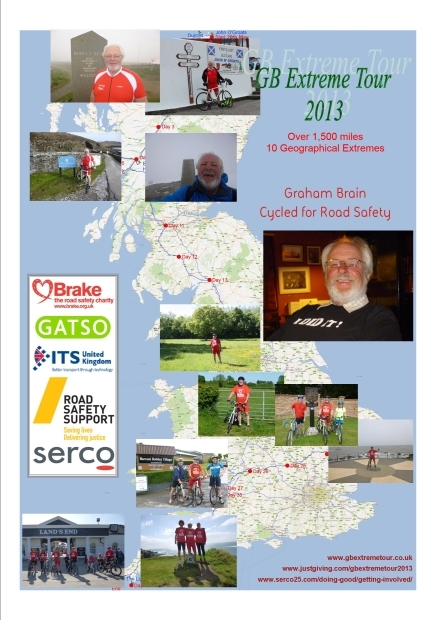 “Brake is incredibly grateful to Graham for undertaking such a huge challenge to raise awareness about the vital importance of road safety and to fundraise for Brake. “His incredible efforts will help us continue spreading life-saving road safety messages and supporting families who have suffered the devastating consequences of road crashes. We would urge anyone inspired by Graham’s challenge – whether companies or individual volunteers – to join him where they can on his route, sponsor him, or do their own fundraising cycle ride for Brake. To sponsor me, please click the JustGiving logo below which will take you to my JustGiving page, thank you in advance.